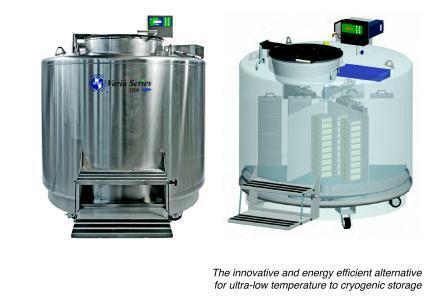 The MVE Vario Series is the innovative and energy efficient alternative for ultra low temperature to cryogenic storage. The completely dry sample storage area will maintain a user defined temperature anywhere between -50°C and -150°C. The MVE Vario Series eliminates the possibility of sample contamination via contact with LN2 while providing the safety margin and consistent temperature profile, even with the lid open, that is associated with LN2 based cryogenic storage. The MVE Vario Series is able to provide all of this and more with less than 1% of the power consumption and approximately 1/10 the overall operating costs when compared to the leading mechanical freezers. There is no information at this moment.